It’s finally here!!! Every fall I add to my tablet a huge pile of new digital ebooks to read during carpool and waiting for my kids at their activities. The ULTIMATE LIVING BUNDLE has the most ebooks with the best titles! Check out the line-up of the books this year, including the bonuses! I understand where you’re coming from. As a mom who has always been interested in healthy living, I still get too busy to make it all happen the way I want. BUT, I still get obsessed with learning all the things I could do, even if it’s small things, for my family! Learn to replace store-bought products with DIY options that actually work and are easy to make! Discover healthy meal planning secrets that are cheaper (and faster!) than the drive-thru, plus get wholesome recipes your family loves! And got access to resources like eCourses that teach what changes to make (and how to make them)! 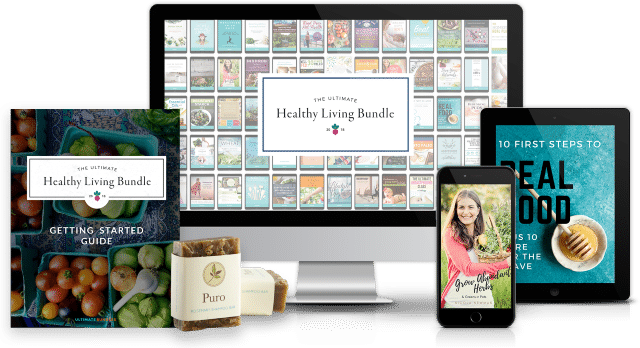 The folks at Ultimate Bundles have put together the popular Ultimate Healthy Living Bundle for the sixth year in a row (hooray!). They’re amazed at how many families are saying “yes!” to their health (over 80,000 and counting!) and taking them up on this super short opportunity to get a complete library of natural living resources for one teeny tiny price. Visit their website, take a quick look at all the goodness that comes in this package, then click the green “Buy now!” button to go through their simple and secure 3-step checkout process. The most important detail, though, is that this bundle is available for just six days! After Monday night, September 25th, the sale ends and you’d have to buy all of these products individually. Our family has felt so much better by making changes to the way we eat, the products we use, and how we take care of ourselves. It’s made all the difference in the world and I want the same for you.